The creative team of Post Carbon Institute’s Richard Heinberg and colleagues has chalked up two more successful publications. Not long after debuting the innovative educational course Think Resilience, they’ve produced an impressive new manifesto titled #NoApp4That, which you’ll want to check out. But first, you might want to watch a short animation, Hello Humanity, It’s Me, Technology. We Need To Talk, which is making the rounds on social media. According to the Post Carbon website, “Many people (even if only on a subconscious level) are waiting for technology to rush in like a superhero to vanquish crises and lead the way to a sustainable future. But technology won’t be our great green savior, at least not without first wrestling with the tough moral dilemmas of our time”. The controversy over the positive and negative aspects of technology has heated up over the past decade or so. This is especially the case regarding proposed high-tech solutions aimed at mitigating potential disasters, many of which are the result of advanced technologies previously introduced. It seems that for every short-to-intermediate term advantage we experience with the advent of any advanced technology, there’s an unexpected and unintended long-term downside. 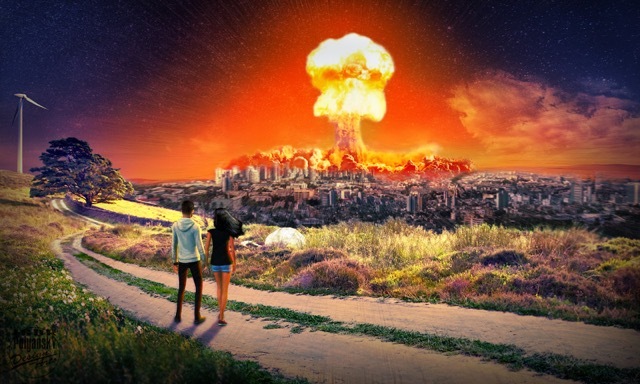 In sum, this is why reasonable regulations are needed: to safeguard the public—and the environment—from potential harmful effects of misused technologies (as depicted in the above artistic illustration of a hydrogen bomb exploding near a city). Among existing potentially dangerous new technologies, the quickening pace to advance artificial intelligence seems to pose a major threat to humanity. Digital technologies, including robotics, are increasingly assuming work normally done by humans. Robotic technologies began with handling rote manual-labor tasks more efficiently, and eventually advanced to managing more mental-type tasks. It’s downright scary to observe the speed at which this field is growing, and to ponder what lies ahead. Experts in AI research and development remain intellectually conflicted over the technology’s future prospects—and its potential for causing both constructive and harmful effects. We need to decide if we’re willing to live in a world where machines provide excessive relief from physical and mental work. Why can’t we seek a humanely determined balance point, whereby essential life-saving-and-enhancing technologies can be maintained at sustainable levels, and expensive, extremely advanced technologies remain limited in scope? It seems the crucial question is: Do we really want to be replaced and controlled by machines? Or do we want to find a way of living harmoniously with nature, all the while maintaining our innate human qualities and acquired values—as well as the many progressive technological achievements that enhance sustainable conditions for all life forms? But such concerns may well be irrelevant. With a host of deteriorating worldwide conditions and converging crises on the table, the likelihood of an economic slowdown or collapse is growing more probable. How so? Because, as energy sources grow too expensive to extract and produce, as climate-change catastrophes grow more frequent and destructive, and as ongoing population growth places extra strains on all resources (especially food), the chances of advanced technologies meeting their promoters’ hoped-for expectations will probably be obstructed—or abandoned, which seems a more likely prospect. Finally, as for the overly optimistic concept of eventually sending humans to populate other planets, beginning with Mars: HA! If we can’t learn how to survive on our home planet, a veritable Eden for existing life forms, how (on Earth) could we morally justify inhabiting another planet, one that’s untouched by humanity’s historical tendency to explore, conquer, acquire, and dominate? Besides, who would really want to live in such an inhospitable, inhumane environment as Mars? Wouldn’t it make more sense for us to figure out how we can live sustainably on this precious one-of-a-kind planet—before it’s too late? > Peak Prosperity: Signs Of Distress (Chris Martenson). The world is edging closer to the final moments after which everything will be forever changed. Grand delusions, perpetuated over decades, will finally hit the limits of reality and collapse in on themselves. Someday there will be hell to pay financially, economically, and ecologically, as there simply isn’t any way to maintain these overdrafts forever. Humans can be very smart, but the flipside of our ingenuity is our capacity for self-delusion. > South Roane Agrarian: Lay A Hand On Something (Brian Miller). Disciplined work habits established early on affect all aspects of our culture, from school and the workplace to the arts and civic sphere. That there is a drift backwards into adolescence that pervades our culture—whether it’s reading cartoonish literature designed for an underdeveloped mind or a political sphere that is dominated by…well, let’s not go there—is extremely alarming. > Resilience: On Transition (!) (Erik Lindberg). Transition is one of the few organizations that tells the truth about climate, energy, and our ecology, while at the same time connecting these truths to issues of social justice, economic inequality, a peace movement, and an understanding of complex international geo-politics, while rolling up its sleeves and building things. But I nevertheless want to offer-up the proposition that Transition should remake itself closer to the model of a political party or a church. > Local Futures: Globalization’s Blowback (Alex Jensen). Globalization has meant the distancing of cause and effect, source and sink, so that the pollution and human exploitation caused in the production and transport of goods has remained invisible and opaque to consumers. Transnational Corporations (TNCs) are the main drivers and beneficiaries of this system. US and other foreign corporations dominate Chinese production and exports, which causes China’s air pollution to reach the US. > Medium: Uncertainty Is The Best Tool To Navigate Toward Our Post-Carbon Future (Josh Floyd). Our present situation warrants a significant level of knowledge humility. We can’t know for sure how future energy systems will function, what they will cost, and the types of societies they will allow, but modeling efforts can provide indications of what is and isn’t possible if given sets of conditions prevail. Greater knowledge humility might provide flexible and adaptive ways of navigating transition pathways. > New York Times: Scientists Fear Trump Will Dismiss Blunt Climate Report (Lisa Friedman). According to a sweeping federal climate change draft report, the average temperature in the United States has risen rapidly and drastically since 1980, and recent decades have been the warmest of the past 1,500 years. Scientists from 13 federal agencies directly contradict claims by President Trump and cabinet members who claim human contribution to climate change is uncertain, and that ability to predict the effects is limited. The report is awaiting approval by the Trump administration. [See also: This Is What America Will Look Like If We Follow Trump’s Climate Policies]. > Washington Post: U.S. Emissions Probably Won’t Increase Under Trump, Study Says. But They Won’t Fall, Either. (Chelsea Harvey). Despite the Trump administration’s large-scale rollback of environmental policies, and Trump’s withdrawal from the Paris climate agreement, U.S. emissions are likely to remain relatively flat over the next few years, according to Climate Policy. But the longer the hold on federal climate action lasts, the more future administrations must do to meet those 2050 targets. > Climate and Capitalism: Report Shows Climate Records Set In 2016. Yes, The World Is Warming! (Ian Angus). The State of the Climate report series, published by the American Meteorological Society for the past 27 years, is the most comprehensive annual summary of Earth’s climate. The new report confirms that 2016 was the warmest year in 137 years of record keeping. Other climate indicators that set new records include greenhouse gas concentrations, sea level, and sea surface temperature. > Think Progress: Deadly Heat Wave, Nicknamed ‘Lucifer,’ Engulfs Europe (Natasha Geiling). The heat wave, which stretches from Eastern Europe to parts of France, Italy, and Spain, has already caused at least six deaths, slowed traffic, and sparked wildfires. According to the study, without substantial cuts to greenhouse gas emissions, extreme weather could kill as many as 152,000 people annually in Europe by the end of the century, with most deaths heat-related. > NPR: A ‘Massive’ Wildfire Is Now Blazing In Greenland (Colin Dwyer). Since at least the end of last month, a stretch of land in western Greenland has been alight with a “sizable wildfire,” NASA says. Peat is especially vulnerable to the effects of climate change—drying out as temperatures rise—and especially dangerous for exacerbating climate change if it burns. NASA satellites have detected an “exceptional” number of wildfires in 2017. > Clean Techica: Flash Drought In Us High Plains May Have Already Destroyed Half Of Wheat Crop (James Ayre). The “flash drought” that came out of nowhere this summer in the US High Plains, afflicting Montana and the Dakotas the worst, has already destroyed more than half of this year’s wheat crop, going by some recent field surveys. Considering that the region is now one of the top wheat-growing regions in the world, the damage is very notable. > Common Dreams: As US Inequality Breeds Oligarchy, Report Details Pathway To Equity (Jake Johnson). Inequality effectively disenfranchises us, diminishing what our vote at the ballot box means relative to the influence of money drowning out our voice in the public square. [See also: Even More Evidence The US Is A Kleptocracy, Not A Meritocracy (Paul Buchheit). Data shows inequality is spiraling out of control. > Minnpost: Some Happier News, For A Change, On Honeybee’s Health And Colony Collapse (Ron Meador). Commercial beekeepers’ losses to the mysterious colony collapse disorder (CCD) were down 27.2 percent, year over year, for the first three months of 2017. Overall, the commercial honeybee population stood on April 1, the latest date for which statistics are available, at 2.89 million colonies, which was about 3 percent better than the year-earlier figure of 2.80 million. > Bloomberg: U.S. Credit-Card Debt Surpasses Record Set At Brink Of 2008 Crisis (Jennifer Surane). Data from the Federal Reserve show outstanding card loans reached $1.02 trillion in June. Investors have been skittish over the potential for defaults to rise ever since card balances eclipsed $1 trillion in February. > Resilience: Living Abundantly in the Sharing Economy: A Voice of Experience (Janaia Donaldson). Freelance group facilitator Tree Bressen has made her livelihood in the sharing economy for over a decade. She has also participated in a neighborhood Gift Circle and an online version called Kindista. In these, people put out what they have to offer, and make requests of what they need. Her personal stories reveal how the circles not only facilitate exchanges, but build relationships. > The Next System Project: Reversing Inequality: Unleashing The Transformative Potential Of An Equitable Economy (Chuck Collins). The US economy’s deep systemic inequalities of income, wealth, power, and opportunity are part of global inequality trends, but US-style capitalism and public policy make inequalities more acute, with observable and felt harm to our civic and economic life. Moving toward a more egalitarian society would realign most aspects of economic and social life for the better. So how can we bring these changes about? > Stir To Action: Review: Doughnut Economics (Anna Laycock). Using a mixture of theory, practice, storytelling and visuals, economist Kate Raworth’s book—Donut Economics: Seven Ways To Think Like a 21st Century Economist—offers a picture of an economy that could genuinely sustain people and planet. For instance, inequality is not an inevitable outcome of economic laws of nature; it is a design failure, and we can and should design it out of the system. > Strong Towns: Can We Help Save Our Cities’ Infrastructure By Growing More Food (Kea Wilson). We talk about the economic benefits of gardening, farming, and otherwise fostering a comprehensive local food system, but we less often talk about the ways that plants—including edible plants—can double as green infrastructure that can take the pressure off the man-made systems we rely on to make our cities function. Rain gardens provide a natural solution to water conservation and use. > Shareable: How Mobile Apps Are Helping People Design And Develop Their Cities (Titiana Ertio). Mobile technologies are reshaping people’s civic engagement in a number of ways. Smartphones have now opened up so many avenues for people to report issues and share ideas to improve their cities, like the Täsä mobile app, which helps engage both local authorities and residents, enabling local authorities to improve services for their constituents. Extreme Heat Events – August 16, 12:00pm-1:00pm.